At least 129 anti-LGBTQ bills were introduced across 30 states during the 2017 state legislative season, according to a new report published by LGBTQ advocacy group Human Rights Campaign (HRC). Twelve of these bills — which range from adoption laws to “religious freedom” legislation — became law, the report noted. 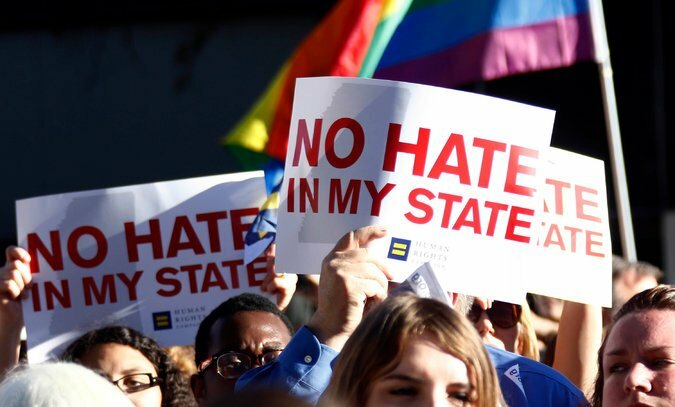 “If an LGBTQ couple drove from Maine to California today, their legal rights and civil rights protections could change more than 20 times at state borders and city lines,” HRC President Chad Griffin said in a statement. HRC’s annual “State Equality Index” reviews the previous year’s state legislation affecting the lesbian, gay, bisexual, transgender and queer community and assigns an LGBTQ-equality grade to each state. In addition to the introduction of bills HRC characterized as “anti-LGBTQ,” the group also found there were 159 state bills introduced last year that sought to expand LGBTQ rights and protections. Twenty-five of these pro-LGBTQ bills became law, according to the report.